CMS is short for ‘content management system’. In a nerd nutshell, Wordpress is a PHP based web app (which is just a bunch of PHP pages) that you install on a web server. Wordpress makes it easy to build and maintain a website since managing lots of content (text, images, video) is super easy in Wordpress, versus building web pages by hand. 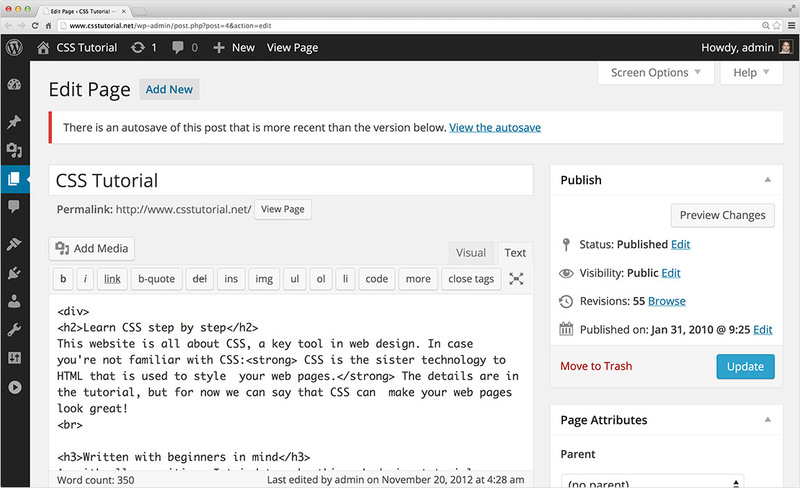 That said, Wordpress can be a bit more work to set up initially. Why should web designers learn Wordpress? Last time I checked, 18% of the worlds websites run on Wordpress! It’s very popular with small business, so you are almost guaranteed to be asked to work with Wordpress at some point - especially if you become a freelance web designer or developer. Design and build Wordpress templates - called ‘themes’ in the Wordpress world. Modify Wordpress - add a shopping cart, add a newsletter etc. This is where knowing PHP comes in very handy, since Wordpress is built with PHP. Beginners PHP - as an added bonus! You can learn Beginners Wordpress without web design skills but building a Wordpress theme requires an understanding of HTML and CSS. Same thing for Beginners PHP.